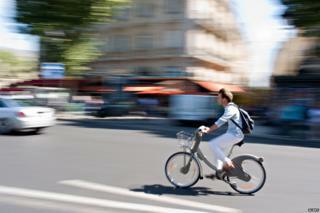 It's easy to enumerate the downsides of Paris cycling. Parisian drivers can be rude and aggressive behind the wheel. They sound their horns loudly and gratuitously. They stop willy-nilly on busy roads to run errands or do a bit of shopping. Diplomatic plates are the worst. Most aggravatingly, Parisians are appalling signallers. They turn without advance warning - or to add insult to injury, they start to indicate as they turn. That is like a V-sign to the cyclist. It shows the driver knows about the indicator, but could not care less what it is for. And one other thing: the way blocks of flats refuse the right to park bikes in communal areas. So you have to leave them on the pavement. But it is good to be able to report that in recent years so much has also improved. For bikers today, the boons in Paris are better than the banes. Image caption "If the light is red but equipped with one of these two panels, you can: Turn right; Go straight on"
"What we want to do is make life easier for the cyclist. Stopping and starting requires energy, and too often it is completely unnecessary. By not having to stop, they can get where they are going more quickly," says Najdoski, who belongs to the Greens. "It is also a way of regularising a practice that is so widespread there is no point in trying to prevent it. As long as cyclists slow down, and if there are pedestrians they stop, then it is all perfectly safe." Lobby groups are delighted because they have been pushing for the change for years. "It is a great advance because it shows we are moving away from the idea that red and green lights are all that count," says Kiki Lambert of the group Mieux Se Deplacer a Bicyclette (Getting around better on a bike). "If we have that attitude, then we turn people into automatons and it is much more dangerous. People end up thinking that just because a light is green it is safe to go - when it might not be... Far better to use all our senses all the time. "Also allowing cyclists to proceed is safer, because it means they avoid getting caught beside trucks and buses as they wait for lights to change. That is the origin of a lot of accidents." Lambert points out that the two ends of the Champs Elysees - the Arc de Triomphe and the Place de la Concorde - have different systems for regulating traffic. At the Place de la Concorde there are traffic lights; at the Arc de Triomphe - with its 12 avenues entering the bewildering Etoile roundabout - there are none. Yet the accident rate at the Place de la Concorde is five times higher than at Etoile. "That is because at the Arc de Triomphe drivers are obliged to be careful. The traffic lights act as an automatic trigger, and that is dangerous," she says. The new red light rule for cyclists is part of a series of measures devised by the Hotel de Ville with the aim of dramatically increasing cycle use. New cross-city cycle routes are being created, as well as 10,000 new parking places for bikes. From 5% of trips today, the hope is to push that up to 15% by 2020. "In French towns today, 40% of car journeys are less than 3km (two miles)," says Najdoski. "These are trips that could easily be done on a bicycle - so we have to make it logical for people to make that move." Safety will also play a part. At the moment there are only on average between three and five cyclist deaths every year in Paris - though the figure is deceptive because it does not count accidents outside the perif or ring road. Inside Paris proper, traffic moves quite slowly and the few fatalities there are tend to be when cyclists are caught on the inside of heavy vehicles. "The more cyclists there are, the safer it will be - and not just for cyclists. For everyone," says Lambert. "Because everyone will be going more slowly, and everyone will be keeping their eyes and ears open. And not just waiting for the lights." Cycling in Britain is often perceived as dangerous, but how much have the risks of riding a bike changed, and how do they compare with driving a car, asks statistician Jamie Jenkins. There are more bicycles than residents in The Netherlands and in cities such as Amsterdam and The Hague up to 70% of all journeys are made by bike. The BBC's Anna Holligan examines what made everyone get back in the saddle.